How to ensure your feed contains all the right ingredients? Some of the ingredients in animal feed, contain food already suitable for human consumption. This challenges feed millers to make sure the final feed is containing all the right ingredients to become an effective feed for the benefit of the animals and the food on the table! Pelleting is a well-known process in the compound feed industry. The transformation of feed meal into pellets has benefits regarding nutritional properties and logistic handling of the end product. Because the meal is formed into pellets after mixing of the ingredients, each pellet contains the nutrients as specified by the nutritionist. This prevents selective eating of the animals, ensuring each animal will consume a balanced diet. Pelleting of the feed also improves the logistic properties of the compounded feed. The pellets have a higher density then feed mash, enabling more feed to be transported in the same shipment. Furthermore, the dust formation in the product handling is significantly reduced, resulting in reduced (cross) contamination through the entire logistic process. By adding more steam, gelatinization is improved and the meal can be pelleted better. This results in a higher capacity, improved quality and less energy consumption. By increasing the roller gap distance to the die a higher quality can be realized because more pressure (mechanical energy) is applied. This will however have a negative effect on capacity and energy consumption as more power is needed to force the meal through the die. The same effect can be achieved by changing to a die with a larger die thickness. There is a limit to the quantity of steam that can be added as too much steam addition can cause roller slip. The consequences of a roller slip are severe. Operators are always very cautious for this because – in worst case scenario – it will not be possible to get the die to pellet again. When the die needs to be replaced, it takes at least one hour. This is why many feed millers tend to load the pellet mill on the safe side. Also the frequent adjustment of the rollers is often skipped. Changing the roller continuously by hand would negatively influence the required capacity. Van Aarsen has launched a new generation of pellet mills with motor-operated roller adjustment and active roller slip control. This means that Compound feed manufacturers can always produce exactly the correct pellet quality with one push of a button. Moreover, with the new CU Dynamic pellet mill, producers can prevent downtime caused by the mill becoming blocked. This can result in a 15% increase in production capacity. Van Aarsen developed the new CU Dynamic pellet mill with motor-operated roller adjustment especially for compound feed manufacturers who have to make regular recipe changes. With this new pellet mill feed producers can set optimum roller distance to the die with one push of a button. Thanks to a link to the factory automation system it is possible to select the correct roller setting automatically for established recipe settings. This means the recipe can be changed quickly and easily. As the mechanical energy factor can also be determined by setting the roller distance, the die (thickness) does not have to be changed as often. This also helps reduce downtime. The new CU Dynamic pellet mill is equipped with an active roller slip control system. When the rollers slip and the mill threatens to become full, the system detects the slip and takes immediate action. The active roller slip control presses the rollers immediately against the die, preventing the rollers slipping and the meal accumulated in front of the roller is milled away. The control system reduces downtime due to roller slip by 95%. If the mill stops due to another overload, the rollers can be retracted by the motor-operated roller adjustment and pressed against the die after start up so that the mill operates again quickly. The motor-operated adjustment of the rollers is even possible while the pellet mill is in full operation. With this active roller slip control the operator is offered the opportunity to experiment with the roller distance and steam addition for the recipes to boost the feed quality and production efficiency. Operators can rely on this system while exploring the settings for the most optimum production. Feed costs are mainly determined by a few components: the cost of raw materials, labor costs, energy prices, and depreciation, modernization or reinvestment in milling facilities. Feed millers globally are challenged to optimize performance, minimize energy consumption and lower maintenance costs and unplanned downtime. Also here the new generation pellet mill helps feed millers by lowering maintenance costs. The Van Aarsen CU Dynamic pellet mill is equipped with a die cleaning mode so that the operator can clean the die easily whenever he wants. The meal does not have the opportunity to cake onto the die, which results in a quick start-up of the pellet mill. As the rollers retract automatically after each product, there is less wear of the die and rollers and their life is increased by up to 30%. The new CU Dynamic pellet mill by Van Aarsen International from Panheel (the Netherlands) increases flexibility and pellet quality and reduces downtime. This results in an increase in production capacity and also savings on maintenance and equipment. If required, existing Van Aarsen mills can be upgraded to the new advanced CU Dynamic. We’d be happy to welcome you on our stand at the Livestock Philippines. We’d be happy to welcome you on our stand at the Indo Livestock. Van Aarsen celebrates a successful day at VIV Asia. Winning the e-novation award makes us proud. It proves that our innovations are valued in the market place. As Van Aarsen, we invest continuously in new developments. This is how we help our clients face challenges of lowering costs, improving quality and maximizing performance. 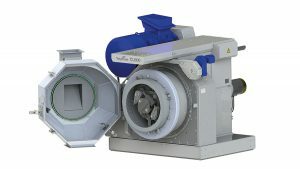 The new feeding device is the result of developing new techniques for minimizing explosion risk without compromising the efficiency and quality of the grinding process. The innovative feeding device integrates a heavy parts separator for metal objects, stones, and other heavy objects. The heavy parts separator detects such objects and removes them to prevent them from being fed into the hammer mill and causing sparks. Besides minimizing the risk of explosion, Van Aarsens new feeding device with heavy parts separator also prevents damage to the screens. This greatly increases the service life of the screens and significantly reduces machine downtime and maintenance. The new feeding device has a compact design and can easily be integrated into the GD hammer mill and the automatic screen exchange. Van Aarsen and Wenger have developed a collaboration framework for the realization of feed mills in the Aquatic feed market. Wenger is a world leading producer and supplier of extrusion process systems for the Aqua feed, Pet food and Human food industry and famous for their innovation and quality. We as Van Aarsen have built-up a broad knowledge and wide experience in every area of the compound feed technology industry and have developed into one of the world’s leading companies in feed process technology. Van Aarsen and Wenger together have almost 150 years’ experience. The extensive knowledge and unmatched quality of both Wenger and Van Aarsen machines form the basis for building world class turnkey feed mills in the Aquatic feed market. Besides the aqua feed market, Van Aarsen and Wenger also cooperate by sharing engineering and process experiences – leveraging key insight and opportunities for the marketplace. This enables us to fulfill the demands of producing excellent animal feed based on more complex recipes.